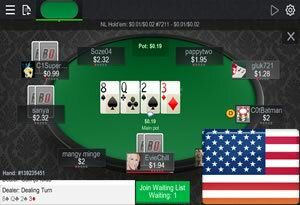 Bitcoin, Ethereum, Litecoin and Bcash poker sites for iOS and Android now allow real money poker players to play Texas Holdem and Omaha anonymously on their phones and tablets. All of our featured bitcoin poker rooms welcome United States players. Poker players are increasingly choosing bitcoin as their poker currency of choice and for good reason. The best bitcoin poker rooms are truly global, allowing players from the any country in the world, including the United States, to sign-up and start playing without providing any personal information. Funding your player account happens instantly and you don't have to pay extortionate credit card fees. While Satoshi Dice and Seals With Clubs paved the way for bitcoin online poker, the new breed of bitcoin poker sites are now offering their players the chance to play bitcoin poker on any iPhone, Android, Windows Phone or iPad. ﻿﻿Nitrogen Sports is the best known bitcoin sportsbook. They've now added online poker that can be played from any iOS or Android device. The United States friendly mobile poker room offers Texas Hold'em/Omaha cash games, scheduled tournaments, Sit N Go's and hourly freeroll tournaments on mobile. BetOnline is an old school online poker site that accept cryptocurrencies, credit cards and band wires. They accept real money players from anywhere in the world and their iOS/Android app offers cash games, Sit N Go's and MTT's. You can deposit and withdraw with Litecoin, Dash, Bcash, Ether or Bitcoin. 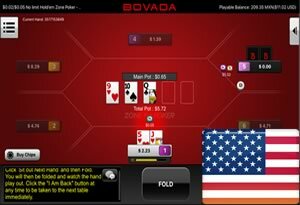 Bovada are a traditional online poker room that accepts a variety of crypto currencies, inlcluding Bitcoin and Bitcoin Cash. Their mobile poker offers both speed poker and regular ring games to real money players in the United States and most Latin American countries, including Mexico, Colombia and Brazil. Getting the grips with bitcoin is far more straightforward than you might expect. Once you've learned the basics you can then go on to reap the reward of playing poker using the crypto-currency. Here are the most common questions that new bitcoin gamblers ask. Can U.S. residents play bitcoin poker? While not every bitcoin poker room or casino accepts real money players from the United States, all the poker apps listed on this website welcome players from the USA. Can I play bitcoin mobile poker anonymously? Yes. To register at any of our featured bitcoin poker sites you just need to provide a username and an e-mail address. You will not be required to submit any documentation that would indicate your true identity, like a copy of a passport or utility bill. Do I need to install anything on my smartphone or tablet? No. Most bitcoin poker rooms have developed their poker software to run from the Safari or Chrome browsers of any iOS or Android device. This means that you can play instantly with a minimum of fuss. Are there any bitcoin poker apps for Windows Phone or BlackBerry devices? Since bitcoin mobile poker software is web-based, it will work on any phone that has an internet connection and a browser that supports HTML5 apps, including Microsoft Lumia, Nokia Lumia or most BlackBerry's. Which bitcoin poker games can I play on my iPhone or iPad? Pretty much any game you would expect to find at major poker site like PokerStars, PartyPoker or 888. Both Texas Hold'em and Omaha variants are available. Fast fold poker is also a possibility and you can even take part in Sit and Go or Multi-Table Tournaments. You can deposit at any of our listed mobile poker sites instantaneously. Payouts generally happen within minutes or hours also and transactions are free. What is the poker rake at bitcoin poker sites? Poker rake is generally much lower. You can expect to be charged 2.5% rake, which is much lower than the 4.5% and 5% charged by PokerStars and Full Tilt Poker.